"The world has witnessed an extraordinary celestial sign Wednesday, 31 January 2018. This sign is a Super Blue Blood Moon. What exactly is this super blue blood moon? It is the conjunction of three lunar peculiarities. 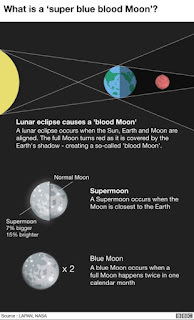 To give a simplified explanation of this phenomenon (or rather divine sign), it is when the natural satellite is at the same time relatively close to the Earth (which gives us a Super Moon), it is also the 2nd full Moon in a month (a Blue Moon) and there is at the same time an eclipse of the moon (a Blood Moon). So it's a super-moon combined with a blue moon and with an eclipse of the moon that was total in some parts of the world and that we call, a blood moon. All three phenomena were visible only in certain parts of the earth, in this case in America (after 152 years) and in the countries of Asia and Australia and so on. But for the countries of Europe, like France etc., this phenomenon, this celestial sign was not visible (but was visible in 1982). But here in Mauritius after 152 years, we witnessed this, but only with a partial eclipse of the moon that lasted only a few minutes. 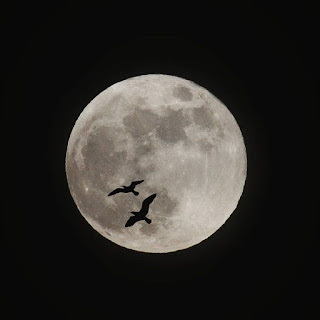 (Inset: Seagulls and the blue moon in Portobello, Edinburgh, taken by Matthew Corney, (c) BBC). This phenomenon/ sign became subject of conversations, with everyone speculating on its meaning. There are those who say that it is an indicator of the approach of the end of the world and that the Saviour will appear soon. But the truth is that we are living the days of the end of the world and the Saviour that everyone is waiting for is already among you. When you see such divine heavenly signs, these are signs in support of the coming of a Messenger of Allah. 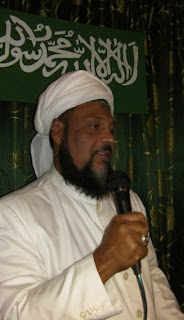 This sign is so rare (during the lifetime of any common man) and the way it has appeared in the world clearly shows that the prophecies mentioned in the Holy Scriptures of many religions in the world and what Allah has taught us in the Holy Quran, all this is the manifestation of signs to make humanity reflect, so that it may reform its conduct. All these manifest signs are announcing also the days of the end of the world, which we are now living. And the Saviour whom everyone expects (and this for all ages to come till the Day of Judgement) has already arrived, is already among you. It is true that a Hadith of Hazrat Muhammad (pbuh) indicates that an eclipse does not occur to announce the birth or death of anyone. 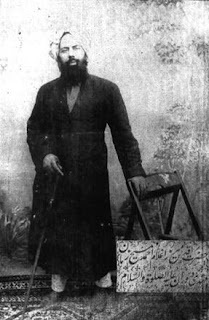 But he also said that for the advent of the Promised Messiah (the Mahdi), there will be two eclipses, one lunar, and the other solar, in the same month of Ramadan, and this is what has verily been manifested in the time of the Promised Messiah, Hazrat Mirza Ghulam Ahmad (as) and also in the time of this humble servant, the Khalifatullah. This celestial sign of Super Blue Blood Moon had also appeared at the time of the Promised Messiah Hazrat Ahmad (as) a few years before his proclamation. 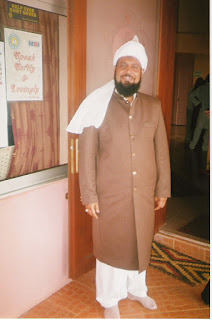 So all of these are signs of terrible events that will shake the world, especially if people do not recognize the Elect of Allah and persist in forgetting Allah, and associate (false) deities with Him (in His worship)..." (----From the Friday Sermon of 02 February 2018 (15 Jamad’ul Awwal 1439 AH).